San Antonio is a distinctively impressive deluxe hotel nestled on a natural volcanic plateau overlooking the sparkling Aegean Sea and the volcanic caldera. The luxury retreat is located in the traditional village of Imerovigli and provides a unique adults only tranquil sanctuary. Enjoy a personal touch and attention to detail in stylish surroundings. Choose from 29 intimate rooms and suites inspired by nature and offering sea views, perfect for weddings, honeymoons, or a romantic break in a beautiful and idyllic setting. San Antonio Hotel offers an inviting infinity pool overlooking the sea, as well as a Volcanic Spa Suite with a Jacuzzi and indulgent treatments and massages designed to appeal to all of the five senses. The Cliffside Restaurant will tempt your palate with an array of mouth-watering flavours, in addition to offering a unique private dining experience. Enjoy a sublime 5-star luxury hotel experience within spectacular natural surroundings. Enjoy a culinary exploration of authentic and mouth-watering flavours from the candlelit terrace looking out over the Aegean Sea. The restaurant offers a truly romantic experience, with unforgettable cuisine reflecting Santorini’s Mediterranean heritage. San Antonio offers the most romantic of private dining where you can spend quality time with your loved one while sampling the finest gastronomic delights accompanied by excellent wines. Accompanied by superb sunset views over the sea, this is the ideal end to a relaxing day. Enjoy snacks, fruit-infused cocktails and refreshing cool drinks beside the infinity pool, while admiring the beautiful volcanic vistas and sea views. The inviting infinity pool appears to jut out over the glimmering Aegean Sea, perfect for a sunset swim. Immerse yourself in total serenity and relaxation within a striking cave. Sample the Jacuzzi and body jet shower, alongside reinvigorating spa massages and detoxifying spa treatments performed by professional therapists in a calming atmosphere. Located on the north west coast of Santorini, San Antonio is in the ideal place for those wanting to immerse themselves in the beauty of the island. It’s in the town of Imerovigli, which is known to have one of the best vantage points in Santorini. The whitewashed buildings are nestled on the side of a volcano and overlook the sparkling waters below, with spectacular sunsets almost every evening. Sightseers will enjoy the pretty churches, village squares and little cafés where you can watch the world go by, coffee in hand. The beaches are just a 20-minute drive away, while the capital, Thira, is within a 15-minutes’ drive. San Antonio is a 20 minute drive from Santorini Airport. Double Rooms have a king-size bed with a seating area and bathroom with shower. The veranda has a seating area and sea views. Facilities include satellite TV, DVD player, minibar, telephone, internet access and bathroom amenities. The Honeymoon Suite has an open plan style with a living and dining area, bedroom with king-size bed and sea views, bathroom with shower and a balcony with lounge chairs and an outdoor whirlpool and beautiful sea views. Junior Suites are open plan with a living area, dining area, bedroom with a king-size bed and sea views, bathroom with a shower and a balcony with lounge chairs. Master Suites are sculpted into the rocks and are open plan featuring a generous living space and a veranda with its own private whirlpool. Master Suites also offer stunning views of the sea. Senior Suites are spacious and have an open plan living and dining area, a bathroom with a shower and a veranda with lounge furniture and sea views. Suites are spacious with a living and dining area and a balcony with a sunbathing area and sea views. Superior Suites are open plan and rest into the rocks for a cave-like feel. They have a spacious living and dining area and a veranda with an outside dining area, lounge chairs and hanging whirlpool and lovely sea views. Save up to 10% on the hotel price for holidays between 01 April - 31 October 2019 booked by 28 February 2019 when staying in a Double Room. Save up to 15% on the hotel price for holidays between 01 April - 31 October 2019 booked by 28 February 2019 (excluding stays in a Double Room). 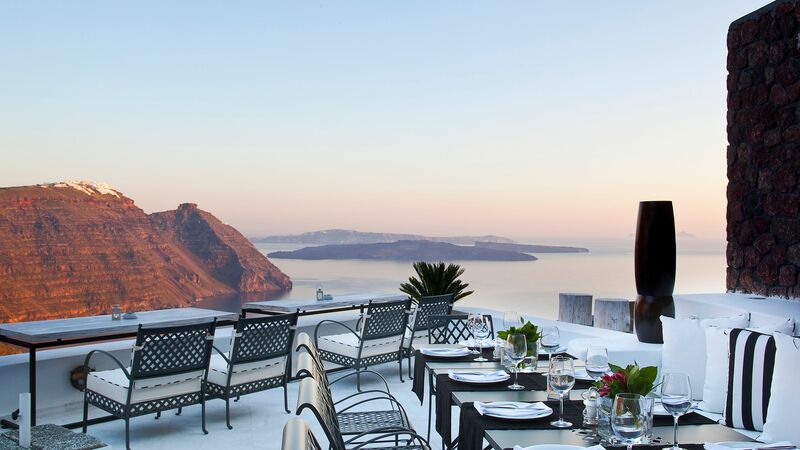 Brilliant Hotel on the cliffside, on the outskirts of Oia town. Views are stunning and unobstructed. The infinity pool is really nice as well. The breakfast buffet has a large spread and the service is amazing. The views from the room and the restaurant are really nice. The room itself is great too, quite spacious with a sitting area, a dining area and the bedroom and a rather spacious bathroom. The spa facilities are amazing - we got a full body massage which was very relaxing. I would definitely recommend this hotel over any other in Oia town as it is much less crowded. 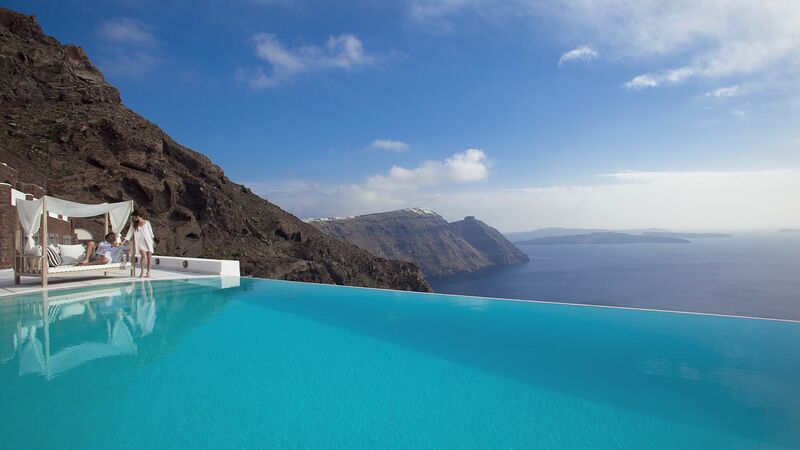 “ Amazing stay on the cliffs of Santorini! Situated on the rock cliffs on the island with great views across the sea and the island. The rooms are spacious and carved out into the rock cliff. Well furnished and serviced to perfection - also loved the big bathroom! What makes the hotel special is the all the great staff looking after you. It can get very windy however which I enjoyed yet one to think of if you don't. Good to book taxis well in advance on the island especially if you are heading out in the evening! Perfect holiday though. This is the best hotel in Santorini, with amazing views, incredible design, infinity swimming pool and with very friendly staff. Just perfect for couples hotel. Breakfast is very nice, waitress are very helpful. Spa center is small but very luxury. Small church inside. Thank you again for incredible holidays!